Small pump in cast-iron with fixed level regulator with magnetic hook-up that starts the pump when the level of the water reaches 28 centimeters and stops the pump when the level decreases to 13 centimeters. Thanks to the fixed regulator the pump can be installed in extremely small pits where there is not enough room for the float-switch. This kind of level regulator does not permit to use the pump with dirty water. 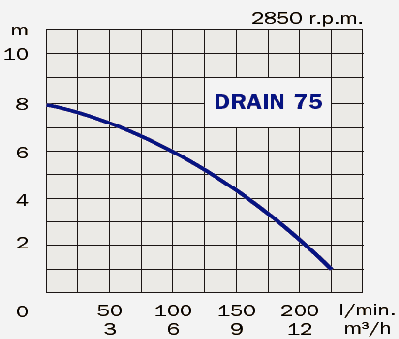 The DRAIN 75 is usually installed in small pits where clean water must be drained.